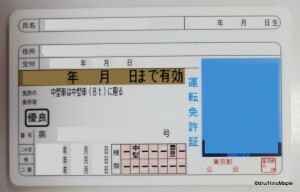 Recently I had to renew my driver’s license. 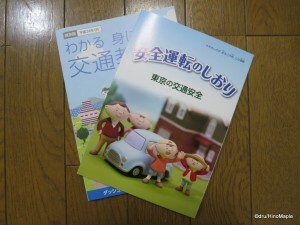 It is not something that I like to do, especially in Japan, but it is something I have to do. I want to keep my license and the ability to drive even though I am currently a paper driver. In Japan, a “paper driver” is someone who has a driver’s license but never drives. I love to drive, but not in Tokyo. The last time I did drive was about 2 years ago when I was home in Vancouver. I keep my license because I do need to use it from time to time. The general process was the same as from when I last had to renew my license at the Toyocho Licensing Office. Since I was getting my “gold” license, I will explain the different licenses in more detail next time, I was able to go to one of the 17 or so police offices that have license offices. These are simple offices that provide gold license holders a chance to renew their licenses as you only need to sit through a short lecture rather than the long one. The first thing I did on this trip was enter the office. I had been there before as I needed to update my address before. There was an old man who was helpful, yet a bit forceful on me to get everything done. I think it was because I arrived just on time and I was holding up the group who was going to get the lecture. He got a little fed up as he was speaking words that I never heard before, so he just grabbed my license and had someone check it. He then proceeded to do everything for me such as getting my application and so forth. After filling out the form, I was ushered, or rather nearly pushed, to get my eyes checked, followed by payment, picture, and secret code. Then shoved into the lecture room where everyone was waiting for me. It was not the ideal situation but it definitely was fast compared to my previous experience at the Toyocho Licensing Office. The lecture was something that I think a lot of countries could do more of but it is still a tedious task. No one ever cares about it and I doubt anyone really pays attention. The lecturer, the old man who pushed me around earlier, started off by handing me a small pouch with a couple books. He started the lecture by going over a few statistics in one of the books. It is not surprising that Tokyo has the second highest number of deaths a year due to motor vehicle accidents. Aichi does take the cake on this one with 225 deaths last year. They also provided statistics that said Edogawa-ku had the most deaths in Tokyo with 15 and Ota-ku had 13. Both Koto-ku and Hachioji had 10 deaths a piece. I doubt this has any long term problems but living next to Edogawa-ku and Koto-ku is a bit worrying for me. 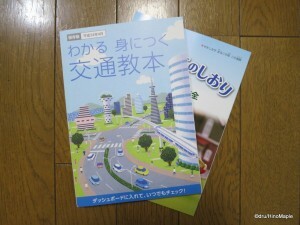 The lecturer also talked a bit about some of the main causes of accidents as well as something about the road problems after the Tohoku Earthquake last year. We then went on to the second book which is basically a road rules book. He highlighted a few rules such as the changes to drinking and driving laws and how many points you get for bad driving. He then turned on the video that proceeded to show us situations that are likely to cause accidents. Thankfully the videos have been updated however they still love using old 90s style graphics. The video highlighted the need to be patient, be aware of blind intersections, and be aware of stop signs. Pretty standard stuff, and better produced than the last video I watched which was about drunk driving. One surprising part of the lecture is how much the lecturer didn’t care about the lecture. He spent a little time interrupting the video to ask who didn’t pay for their license in the class. It was amusing but not instilling a sense that I should pay attention to the video. Once the video was finished, he basically called our numbers and names to get our licenses and I grabbed mine and ran out. Being the last to join the class also meant I got my license last. I am not complaining as I got my license. It is not something I like to do but renewing my license is a necessary evil. I’m just glad that I get to wait 5 years instead of 3 now that I have my gold license. 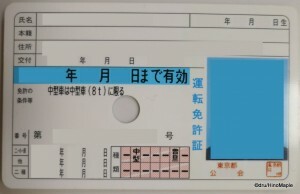 This entry was posted in Automobiles, Daily Life in Japan and tagged Blue License, drive, Driver, driver's license, driving, Gold License, japan, License, Renew a License, Renew license, Renewing a license, tokyo by Dru. Bookmark the permalink. Fifteen deaths a year in Edogawa-ku? I think that’s a morning’s average in Jo’burg in South Africa. It’s a black joke (and that has nothing to do with skin colour). One way to deal with death in Africa is to start cracking sardonic jokes. I suspect people who are often confronted by death – cops, doctors, emergency personnel – all adopt this coping mechanism, regardless of where they live. South Africa’s road accident death is among the highest in the world, with only Eritrea, Angola, Ethiopia, Gambia and war-torn countries like Iraq and Afghanistan registering higher figures. No wonder I can’t just convert my driving licence in Japan. Huh-uh. I have to go through the whole rigmarole again. Ah, dark comedy. Gotta love it. Although coming from Vancouver, driving in Tokyo is a mess, but orderly. At least people aren’t SO crazy. A zebra you park on a lawn and it refuels itself. A cheetah’s fuel is a bit more tricky.